Hey everyone! I am very excited for today’s post! 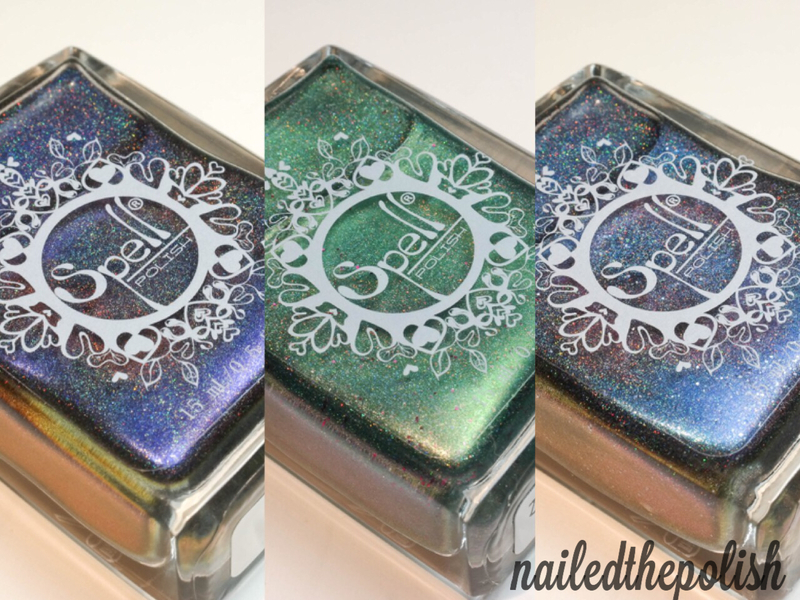 I’ve got swatches from Spell Polish‘s Heart of Stone Trio (exclusive for Norway Nails) to share today. Wenche, the owner of Noway Nails, wanted a trio inspired by the game Hearthstone – thus the Heart of Stone trio was born! This 5-free trio consists of three gorgeous multichrome holographic polishes that each come with a corresponding card. All swatches were taken indoors using a combination of Cree daylight and LED bulbs. Also a quick heads up, I included more photos than I usually do because I wanted to show the different aspects of these polishes. The most powerful spell will control another’s mind and render your victim essentially blind. With this spell you will guide him to bid your deed, though what will the damage be to your creed? Mind Spell is a purple multichrome holo that shifts to pink and orange with added gold shimmer. Shown here is two coats plus top coat. This polish is a little thin but it has a great formula. It is very easy to control thus I barely had to do any clean up, woo! Not only does it apply well, it is also extremely stunning! So many dimensions that come together so well. Here you can see the multichrome shifts starting from blue in the center shifting to purple, pink, and finally to orange. And here you can see the amazing holo! If you know dragons, you know that they dream in colors of emerald, appl, and green. Though only a few of these creatures remain, their slumberous visions give hope for the slain. Dragon’s Breath is a green multichrome scattered holo that shifts to subtle shades of turquoise and blue with tiny magenta microglitters. Shown here is two coats plus top coat. Great formula plus this polish is so unique! I’ve never seen a polish like this before. There is also gold shimmer in this polish that when seen transforms this polish completely. … while my LED bulb showcased the holo and gold shimmer! When elements like water and ice combine their power in one magic splice, frost is created – an irresistible wonder – arresting its oglers while the enemy takes the plunder. Last up is Water and Ice – a blue to purple multichrome holo with added shimmery silver glass flakes. Two coats plus top coat. Same formula as the others – great application and easy to control. Another very unique polish with so many elements! The holo, the multichrome, the glass flakes… there’s even added blue flash! LOOOOVE. I LOVE THIS TRIO. I don’t know how many times I can say it but these polishes are so unique! Usually when there are so many elements packed into a polish, it just gets too crazy… that is definitely not the case here. Everything about these polishes is utter perfection. They are so magical – I just can’t take it. I don’t say this often but you need this trio. Seriously, I have never seen anything like them before… and I don’t know if I ever will! Although this trio is made by Spell Polish, it only available for purchase through Norway Nails. All polishes are 15-mL and are currently being sold individually. Be sure to check out Spell Polish via Facebook, Instagram, and Twitter to see even more amazing polishes!